See Gary Gellman’s This is Jersey video about Ellarslie here. The Trenton City Museum at Ellarslie Mansion houses a fine collection of art and artifacts related to Trenton’s historical and cultural past and present. Permanently on display in the second-floor galleries is a highly regarded collection of tableware, sanitary ware and artware produced in the 19th and 20th centuries by Trenton’s prolific ceramics industry. Also on display is a period Victorian room representing an Ellarslie parlor as it may have looked when the building was a private residence in the 1860s. The museum also boasts a fascinating collection of fine arts, decorative arts, industrial memorabilia and historical objects, displayed on a rotating basis in the remaining second-floor galleries. The first floor galleries are host to changing exhibitions of contemporary art in all media, where visitors enjoy a diverse and exciting visual experience throughout the year. In addition to exhibitions, the museum hosts many special events, musical programs, and art classes. The Trenton City Museum also hosts an annual juried exhibition, the Ellarslie Open, which highlights the abundance of regional artistic talent. This exhibit provides visitors with an opportunity to view the finest regional work from the New York, New Jersey and Pennsylvania area, as well as work from as far away as California. 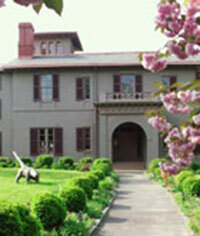 The museum is located in Ellarslie Mansion, an Italianate villa built in 1848. The mansion is the centerpiece of Cadwalader Park, which was designed by the famed landscape architect Frederick Law Olmsted, whose most famous work is New York City’s Central Park. We encourage you to explore this Web site and learn more about the Trenton City Museum, and more importantly, to visit us.